You pay premiums for your dental insurance all year. Many plans cover $1,000- $1,500 in dental treatment and some, even more. By not completing treatment by the end of the year, any benefits you may have remaining will be gone forever. It’s a “use it or lose it” situation. You can schedule treatment now to maximize any remaining benefits for 2018. Many dental treatments span several appointments so it’s in your best interest to use remaining benefits this year. We’ll work with you to maximize the coverage from your dental insurance to reduce your out-of-pocket payments. Funds in a Flexible Spending Accounts (FSA) usually don’t roll over to the next year. If you or your employer has contributed dollars to your FSA throughout the year, that is cash you can use towards dental care. Don’t let it expire. You may save money to have preventative care, such as cleanings, x-rays and exams completed this year. While these services are often covered at 100% with no out-of-pocket cost to you, the cost of the services still counts towards your total annual dental insurance benefit. Schedule any overdue preventative services this year, and you’ll have your full benefit available next year should advanced treatment become necessary. Some plans may have a “rollover period” allowing you to use your benefit in the subsequent year, but often only a reduced amount is carried over. You still loose the opportunity to use all of the insurance benefit paid for by your monthly premiums. Healthcare costs are significant to most families. 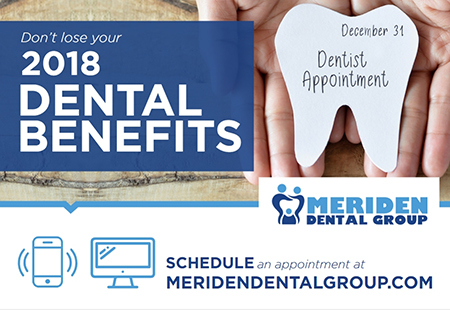 Schedule an appointment today and use your maximum 2018 dental benefits that may expire on 12/31/18. Take advantage of any unused Flex Spending Account (FSA) or Healthcare Savings Account (HSA) benefits you may have remaining. The end of the year is fast approaching so book early and we can help maximize your insurance benefits. Speak with a front desk staff member to verify your insurance and confirm any remaining benefits.